This page will document the steps necessary to get Linux running on the Netier XL1000 platform, or at least how I did it. standard PC hardware including USB, parport, ethernet, IDE, VGA, PS/2, and serial ports (wow!) 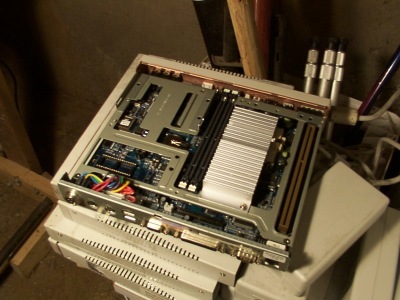 AMD K6 processor, and accepts standard low-profile SDRAM modules - i've got 256 mb of RAM in one right now. weird power supply connector - make sure that it comes with the power supply! however, one should be able to bypass this connector and go straight to the AT-style connector on the board. i'm not sure if the pinout is the same as an AT power supply. processor heatsink looks like it requires good ventilation. making it water/dust proof could be annoying. somewhat slow processor speed of 233mhz, If this is enough to do hexapod kinematics calculations at a reasonable rate remains to be seen. might be able to overclock it with a good heatsink. Based on "PukiWiki" 1.3 by yu-ji. Powered by PHP 5.3.2-1ubuntu4.5. HTML convert time: 0.102 sec.